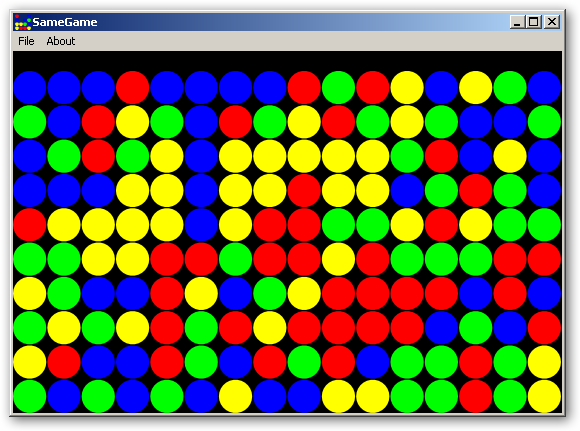 SameGame is a simple and fun and exercise brain power game, developed based on a TI-calculator game. The idea is simple: click groups of blocks to increase your score. The more blocks in the group, the faster your score will increase. The scoring algorithm is based on an exponential equation if that makes since. If you get all of the blocks to disappear, you move onto the next level.If you've never played this game before, the concept is simple. If you've never played this game before, the concept is simple. The object of the game is to clear the screen of blocks. You do this by clicking on groups of colored blocks. Your score increases exponentially which means that the more blocks connected together, the faster you score increases. Qweas is providing links to SameGame 2.0 as a courtesy, and makes no representations regarding SameGame or any other applications or any information related thereto. Any questions, complaints or claims regarding this application SameGame 2.0 must be directed to the appropriate software vendor. You may click the publisher link of SameGame on the top of this page to get more details about the vendor.